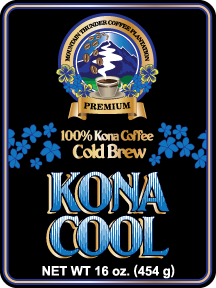 Kona Cool Cold Brew is a dark, rich roast ground coarse, designed to be steeped in water for 24 hours in your refrigerator. It makes for the perfect summertime coffee drink, served cold. The Cold Brew process provides a smooth, yet bold, flavor that is a low-acid coffee with increased antioxidants. Cold Brew, after steeped, is a concentrate and can be enjoyed straight, on the rocks, cut with water, and enjoyed with cream/sugar. This refreshing Kona coffee drink is an ideal drink when you want a cold coffee beverage on those hot summer days. This item ships in one 2 pound bag. Mountain Thunder 100% Kona Cold Brew is characterized by its dark roast, with a special coarse ground just for steeping, which creates a low acid, medium body coffee with a balanced taste.